Making a new GWBasic game. When I was young I learned to code using GWBasic, a BASIC interpreter that came with MS-DOS 4.01. I’ve posted some code and talked about it in the past, but not really developed anything new, that is until today. I’ve re-written a game from scratch I had lost on a corrupted floppy disk called dodge, yes it’s not much of a name but it basically describes the game play in that you dodge bad guys and collect score items for points. The original had some basic EGA graphics, but this time I’ve used text-mode characters for a few reasons. Firstly it is easier to implement both in terms of artistry and coding. The original never played well due to slowness in the interpreter and the implementation that I had used. Finally using text mode increases the effective game play area by more than 2 times, which will allow for more interesting levels. I didn’t implement any sound either in the original or the new, but music often doesn’t work well on the PC speaker and I’m not much of a composer. Being a much more mature programmer I’ve been able to make the game mechanics better and add features that the original never had. There are 5 built-in levels (encoded with RLE) and the capability to load a custom level from a text file. 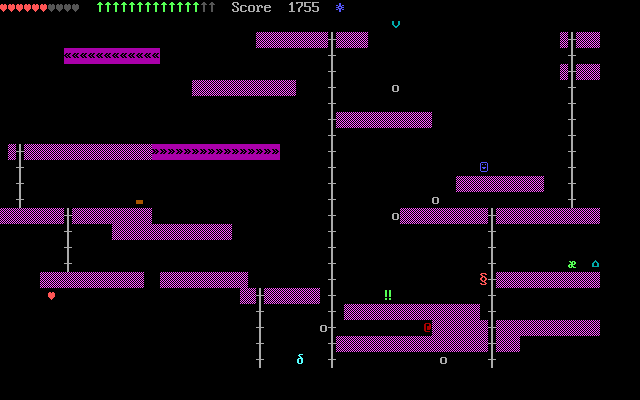 The original only had randomly generated levels that were far simpler. I’ve made the movement of enemies better than the original, and gravity affects most items so that they are reachable. I could have coded the game using a modern text editor, but for that extra nostalgic feeling I coded the game in the interpreter itself. It’s not as intuitive of course as you can’t simply scroll back and forth through the program, instead needing to use the LIST command to see parts of the program. Luckily editing a line isn’t too bad, as after display it on screen you can edit it easily. The interpreter also has some nifty features that can speed up program entry. Many keywords such as print and input have keyboard shortcuts, usually alt and the first letter of the keyword. This not only sped up program entry, but enabled me to discover keywords when I was a kid before I got the user manual. Using the interpreter to write the code does however demand much more of your memory, I don’t remember this bothering me much as a kid, but now as an adult I needed to keep notes on the structure of the program and variables used. I would have written these out by hand on a notebook back in the day, but doing the coding with the interpreter running in dosbox meant I could run a text editor for my notes. It’s probably one of my more complex gwbasic programs at 592 lines of code. Overall it has been quite fun writing with gwbasic again, like revisiting somewhere you went as a kid. I’m making the code available at the usual places, both my download website, and my google drive (in case the website is down). The code should work on QBasic as well as the original interpreter.